It's the last day of January! I wish I had a bunch of stuff to show you but January has just been slow. I have not finished any monsters! Can you believe that!? I have so many started, but nothing done. I haven't even knit in a few weeks... and for me, that's weird. What I have been doing is a ton of crochet. I've been making hats, chunky yarn cowls and I just finished an infinity scarf for friends. All these things are practical. It has been SO COLD. So very very cold. I took this photo because I needed to have an artist picture for a website that will be selling clothing using my designs. That site will be launching soon and when it does, I'll post the link here! The photo shows one of the crocheted hats I mentioned before. February will bring new things! 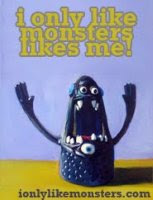 I have a show on February 14th so, at the very least, it'll mean that the pile of unfinished monsters will be finished. I don't have much to say about this one... just another drawing of my favorite little person, Annie! Here's the other drawing from last summer in case you missed it. So, it's 2012? How did that happen? In a previous post I super excitedly mentioned that I am swapping with Mereware. She's getting a monster face hat and I'm getting some of her robot pottery! I was so excited that I started knitting the hat as soon as she agreed to trade! These hats are not a quick knit. First I have to knit the hat to the brim, then I have to knit both earflaps separately, then attach the earflaps, then knit and attach the horns, then sew in the lining, teeth and sew on the buttons... in other words, time consuming work! So imagine how dumb I felt when I went to attach the earflaps and realized that I knit the wrong sized hat... I knit a kid's size rather than adult. Oops. So I started knitting again... and working to knit up a whole new hat. The above picture is the smaller sized hat. It's a bit tight on my head but still looks cute... but I'm not about to give someone a hat that doesn't fit because that would just be stupid. Below is the second hat, the hat for Mereware! The first hat I'll probably put up on etsy next week. I need to list those yetis too [four more yetis are about to be born!] I'll let you know as soon as that all happens. For now, if you'd like your own custom hat order one HERE! Monster hats are awesome gifts... even though winter is [hopefully] almost over. If you'd like one, contact me! I'd love to make you one! They're so much fun! All the yarn is 100% acrylic and typically I like to knit with wool. The yarn isn't that bad for acrylic and the colors are pretty sweet. I used both the Vanna's Choice and the Vanna's Choice Baby lines and the colors Mint, Pea Green, Chocolate Cake, Berrylicious and Magenta. I think the yarn is pretty good for hat knitting and I've used it in the past for some of the bigger monsters I've made where I've used it double stranded when I couldn't find a chunky yarn in the color I needed. Sometimes the clay bust I made my college Figure Modeling class sure does come in useful! Bob Booth would be proud. I have a few more pictures that I just added to the erinmakesstuff page on facebook too, so check those out... mostly different angles. Hey everyone. My new years resolution is to update this site more often... and update my etsy more often, but we'll take things one step at a time. I haven't actually finished much lately because the things I have been making are more experimental and time consuming. I made a few items to enter in the Vanna's Choice Contest [which I will post at a later date once I take better pictures. What I wanted to show today are two hats that I made recently with hopes that some of you will give some feedback. I have my own ideas about what works and what doesn't... but I'd like to hear from you what you think and what you'd like to see in a monster hat. Please excuse the dorkiness of all these photos, but it's really hard to photograph a hat that is so intrinsically dorky with a webcam and look like anything other than a huge dork. So anyway, want a hat? I'll be able to start working on more custom orders soon. I just need to finish... and really work on! The 5 awesome monstapi I'm making for Hope Gallery. It really feels good to experiment a bit more... but I dunno, I'm still not leaving my comfort zone. I need to push it more. Hope to hear from some of you, leave comments here or on facebook!